When your kids play, it might look like they're merely having fun. However, they're actually developing their brains. Numerous studies show that play helps young brains blossom. Learn more as you encourage the kids you love to play. Recess is more than a way for kids to get fresh air. Studies show that kids pay more attention in school after they take breaks for free play without adult direction. Chinese and Japanese students understand the correlation between play breaks and improved attention. They rank high in academics perhaps in part because they take short breaks every 50 minutes. We know kids aren't born with the ability to talk, but did you know that play develops essential language skills? Our kids learn how to communicate with receptive and expressive language, which means they understand more words and speak more words, thanks to play. Learning how to solve problems is a skill I want my girls to learn. They can become better problem-solvers as they play with multi-solution toys and pretend. According to psychologists, there are two types of problems. Convergent problems have one solution, and divergent problems have multiple solutions. Kids are better able to solve divergent problems when they play. In one experiment, some kids were given puzzles, a convergent toy, while others played with blocks, a divergent toy. They were then given a divergent-thinking test, and the kids who played with blocks were better able to solve the problems. In another study, kids who played pretend also had a greater ability to solve divergent problems. The ability to control impulses, attention, and emotions is super-important for kids, and they can actually learn this skill through play. One study found that kids who frequently engage in pretend play also frequently practice cooperation and conforming to rules. This practice develops their self-control and hones their self-regulation over time. 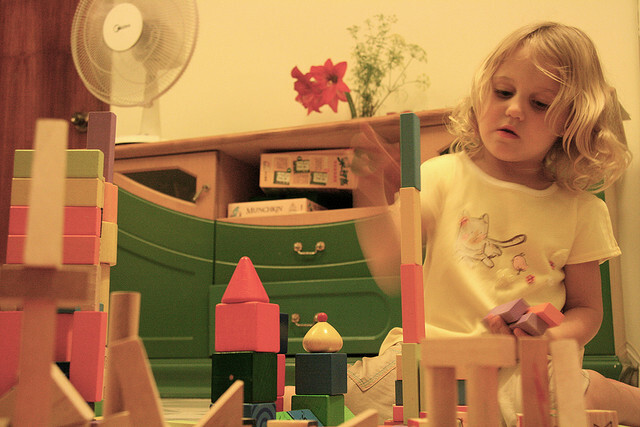 Another study links counterfactual reasoning and pretend play. Basically, play helps our kids learn how to infer what's going to happen even though it hasn't happened yet, and I know that I want my kids to master "what if" scenarios as they go through life. The blocks your kids play with aren't just toys for building, sorting, or stacking. Studies show that kids who engage in more complicated or sophisticated block play in preschool take higher-level math classes and perform better than their peers in high school. IQ does play a part for these kids, but they need play to develop their math skills, too. Do your kids enjoy playing imaginative and make-believe games like my girls do? If so, they're building real-life coping skills. Preschoolers as young as three understand the difference between real life and fantasy in part because of their pretend play. They also know that they can put their pretend experiences into practice with friends, at home, or in school. The next time your kids ask to play in the mud or build a sand castle, let them. These types of messy play activities promote scientific awareness and build a child's understanding of physics, textures, and matter. Have you ever made the connection between play and brain growth? Our kids grow and learn because we give them freedom to play. Let's raise smart seeds as we encourage young brains to blossom while they play!